When you think of your childhood, what comes to mind? I think of all kinds of random stuff. I'm an 80's kid. One of my favorite things was Sesame Street. Do you remember all of the characters on there? One guy that made it HUGE is Elmo. I think our generation is happy to have that piece of common ground with our little ones. 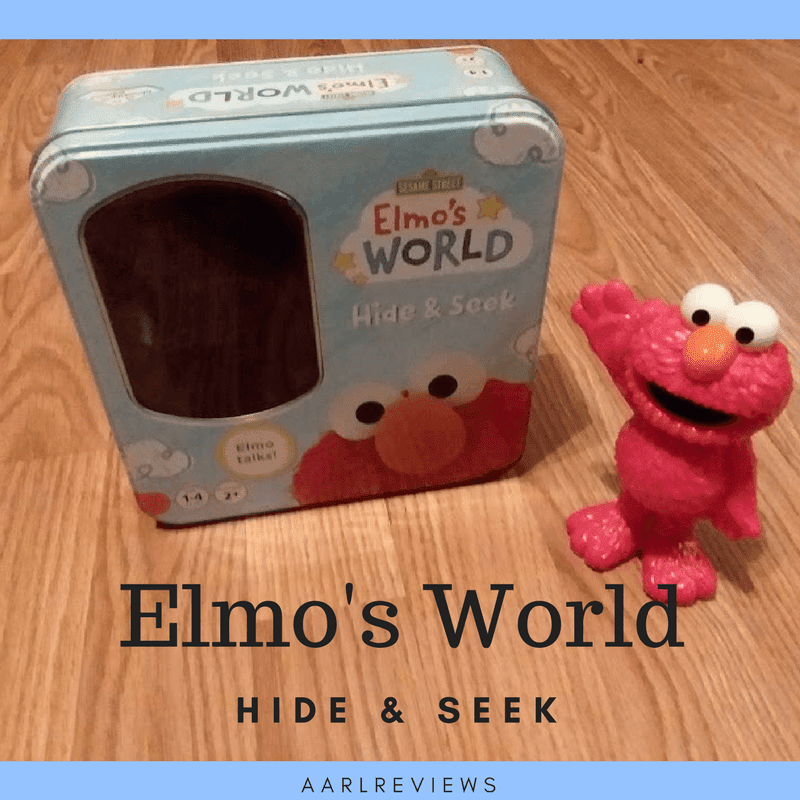 W just had the opportunity to work with Elmo on a review of the Elmo's World Hide & Seek. This is a game/toy that grows with your little one from 1-4 years old. We love things like this because the kids don't outgrow it so fast. It's 2+ player game with 3 levels of play. It's a great way to teach our kids as well as a fun way for them to learn. The tin box is great for easy storage and safekeeping when he's not in use. The battery operated Elmo takes 2 AAA batteries (not included) to make him function. He talks and says little phrases to participate in the game and make sounds to be found. It's so cute!! All babies love Peek A Boo. This is an age-old game that all parents play with their babies. It really is pretty fun. So the way to play is to cover the Elmo with a tissue and pull it off saying Peek A Boo! What that does is gets the baby familiar with the toy. Elmo makes his Elmo noises this shows the little one that out of sight doesn't mean it has disappeared. As a mom, I think this idea is a good one. Especially for the littles that think they have been abandoned just by mommy or daddy setting them down :) I had one of those once. My hip turned into a baby seat. Even if there was no baby on it, I still stood with the one leg out, hip tilted up, I could hold my daughter "hands-free". For only being a size 12, I felt accomplished. This one is fun. Take the Elmo and set him behind items like a shoe or pillow. 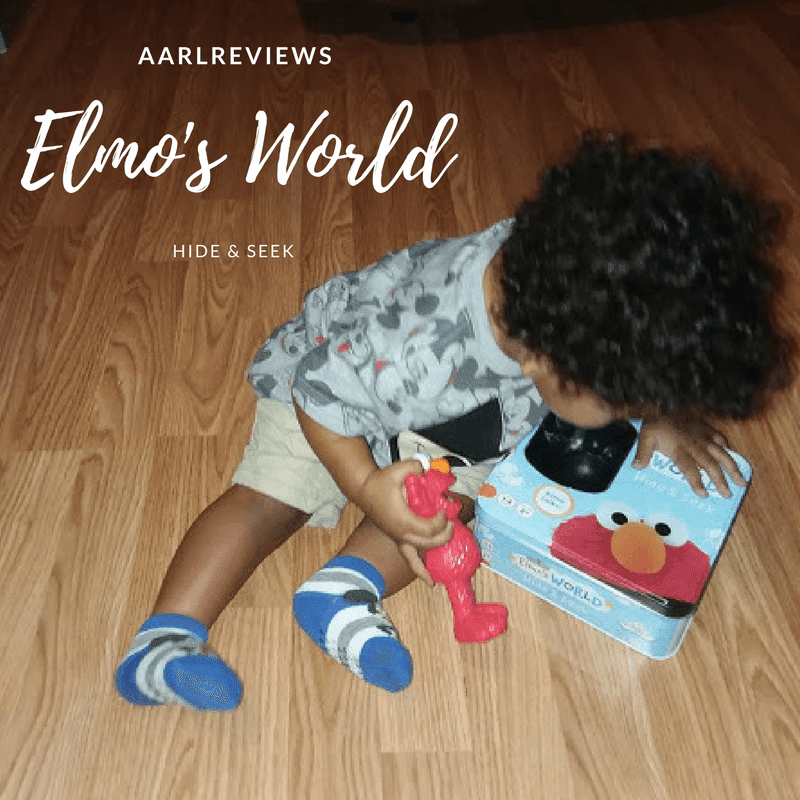 Turn on the "on" switch so Elmo makes noise and the toddler can find him. These cute little cards are the clues to find the hiding Elmo. The little guys hold their hands over their eyes and the grown-up hides Elmo by one of the 3 cards you show them. THat is the hints they need to find Elmo. It's cute!! I love this Elmo's World Hide & Seek game. This is the perfect way to introduce fun play and reasoning to babies, toddlers, and preschool-aged kids. Not to mention how cute it is. Who doesn't love Elmo?